Follett's Symphony series ice and water dispensers are effective for employee break rooms, refreshment areas or anywhere water is provided. The product line offers attractive styling and compact designs that provide maximum serving capacity in a minimal amount of space. The Symphony series offers models with 12, 25, 50 or 90 pounds of storage. 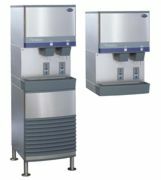 Standard features include stainless-steel construction, integrated air-cooled icemaker, and separate ice and water chutes. The icemaker produces 400 pounds of ChewbletTM ice in a 24-hour period, and its quiet operation enables flexible placement in and around work areas. The dispensers can replace bottled-water coolers. Exmark® has introduced the E-Z Rider, a new dedicated stand-on designed to help lawn-care professionals maximize the productivity of their Exmark walk-behind mowers. The exclusive QuickMount system allows the operator to easily attach and detach the E-Z Rider in seconds. It also enables an operator to fold up the E-Z Rider, securing it with a latch to the mower's engine frame. Doing this minimizes wear and trailer space requirements, and the integrated latch design eliminates the need for accessory straps or cords to secure the stand-on during transport. The large, stable operator platform facilitates operator control and safety. Manitowoc Ice, Inc., a leading manufacturer of commercial ice machines for the food-service industry, offers its largest capacity 30-inch-footprint ice machine, the S1200. This model produces up to 1,230 pounds of ice daily and offers the same industry-leading benefits associated with sanitation, savings, sound and serviceability as previously released models in the S-Series line. Improvements in sanitation make surfaces and parts that require cleaning 100-percent accessible from the front of the machine. The food zone has soft, rounded corners for quick and easy wipe-down. Minimal sound is achieved by placing the compressor on its own raised platform. The Lil' PikNikTM table by Southern Aluminum is specifically designed for parks, playgrounds and other facilities that require a safe and durable product for children. A small version of the popular Southern PikNikTM table, the Lil' PikNikTM is engineered to be wear-resistant. It is durable enough to be used both indoors and out, and its lightweight aircraft-grade aluminum construction can support more than 900 pounds of weight. The table top and seats have generous radius corners to prevent injury, and the benches have a no-tip design. The Lil' PikNikTM comes in four bright powder-coated finishes and carries a 99-year warranty. The Quattro Seesaw from PlayworldTM gives an old favorite a new twist. Up to four children can bounce and spring at the same time, making for tremendous play value and cooperative play. The springing action provides fun and bounce, while the attractive hand- and foot-holds and textured seats provide a secure ride. The Quattro Seesaw is available in a range of vibrant colors, and the optional seat back ensures that kids of all ages and abilities can join the play. 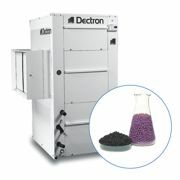 Dectron, Inc., a leading international manufacturer of indoor air quality equipment, now offers the Chloraguard® indoor air purification system that removes harmful chloramines and other airborne contaminants commonly found in indoor pools spaces. Chloraguard is a gas-phase air purification module option that's factory-installed inline on the return air of new Dectron Dry-O-Tron® dehumidifiers or field-retrofittable on any existing pool dehumidifier brand. Conventional particle air filters that come standard in all dehumidifiers and air handlers can't remove chloramines, but the Chloraguard filter uses proprietary formulated chemical media, Multi-Mix®, to remove chloramines and other contaminants found in the pool's warm, humid environment. As the compact utility tractor industry continues to grow and change, so do customers' needs. John Deere responded to those needs with the Twenty Series. 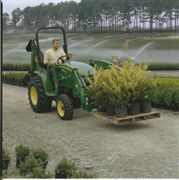 In spring 2004, John Deere introduced its line of Compact Utility Tractors with the large-chassis 4000 Twenty Series. It now offers the new 3000 Twenty Series. This series offers four new models—the 3120, 3320, 3520 and the new high-horsepower 3720—that range from 30 to 44 horsepower. These tractors feature powerful, Yanmar, Tier II compliant diesel engines, while the 3520 and 3720 also include turbocharged performance for more powerful and efficient operation. New for 2005, Kay Park Recreation offers the attractive Recycled Plastic Park Bench with cast aluminum legs and center support. This functional, maintenance-free beauty is an effective accent for a variety of settings. You can request a free color catalog with more details. 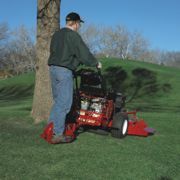 Kay Park has been manufacturing and distributing "America's Finest" park equipment since 1954.